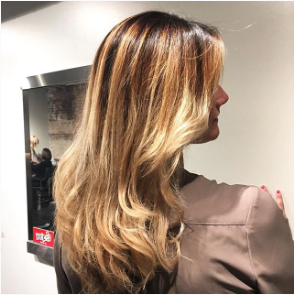 The stylists at Crimson Hair Studio are hair color experts and even your most natural tones and are applied with painterly technique and talent. With so many color products, dye trends, and fashion colors running amok, we wanted to paint a picture to display the benefits of our new hair color line: Kevin.Murphy Color.Me. Crimson Owner & Master Stylist Jen: After searching for the perfect ammonia free color line, Kevin Murphy finally created not only ammonia free, but PPD free. I’ve found many clients complaining of terrible itching during and after color services, after determining it wasn’t ammonia that was irritating them, it was the ppd’s or Paraphenylenediamine. Although many clients still suffer from allergies like soy, gluten & aloe (which all exist in hair colors) PPD’s caused the most issues. Kevin Murphy has given us great results, and no irritation! 100% gray coverage, moisturizing for the hair using a honey base, and less fading are all bonuses with this line. Jeanne: It was easy to embrace the KM color line, because I love the whole Kevin Murphy line of styling products. What I have always liked most about KM is I can set my clients at ease informing them of the organic ingredients that can be found in all Kevin Murphy products. KM Color.Me is no different: the ingredients are formulated to produce rich, beautiful colors while maintaining the integrity of the strands, leaving clients with hair that looks and feels shiny, smooth, and luxurious. The whole team at Kevin Murphy is dedicated to creating the best products that they can because they care about the environment, and the overall health and wellness of the people they are creating their beauty products for. Francesca: KM color has been wonderful in the salon. Clients love being familiar with the name since we all love KM styling products. As a stylist, I love how versatile Color.Me is; it can be semi or permanent. Sarah: I love Kevin Murphy color for so many reasons. The best thing about it is that you don’t have to give up vibrancy and quality for the environment. I feel like I can achieve so much working with it that I almost use it exclusively. It’s easy on the skin too because you don’t have to scrub stains! Lauren: I have plenty to praise to give the KmColorMe Line & so far my clients are still loving their color since switching! The first thing I love is that I can finally offer my clients a gentler formula that’s better for their hair AND the enviroment! Then there’s the fact that there is no harsh chemical smell that burns your clients eyes and their nostrils. And finally, No complaints of a stinging or itchy scalp. All good things People! The gray coverage is great! I REALLY love mixing and customizing those perfect Red Brown& Copper Autumn Tones to add just the right amount of warmth and depth for rich, natural looking results. I saw equally stunning results when using the Chocolate Brown & Ash Tones, for those brunettes who don’t want to see any red.